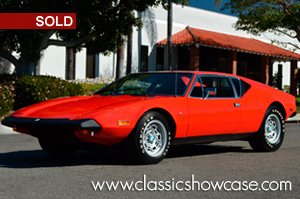 (SOLD) This highly original 1974 DeTomaso Pantera L has covered just over 27,000 original miles, and stands as one of the best examples we've seen in recent memory. The body has been repainted once since new, and is finished in its original color of Red showing excellent lines throughout. The Pantera's interior is all original - from the carpet, seats, kick panels, console, dash, door panels, headliner, seatbelts, to the interior bulkhead, all showing well, with little to no wear. All of the Pantera's glass including the rearview mirror and windshield are original, and the car features power windows, with all factory gauges in proper working order. The collapsible spare tire has its proper anchor, tool kit, and pouch that are present. Under the hood, the car is powered by its matching-numbers 351ci 4V Cleveland engine with the correct Ford 4V intake manifold, Motorcraft 4300D 4-barrel carburetor (with a recent rebuild), dual point distributor with fresh points, and factory air cleaner assembly with soft down tube. Backing the engine is the correct ZF 5-speed manual transmission. The radiator has been recently replaced with a new aluminum 2-way correct split-flow unit, but the original radiator will accompany the car. The Pantera is finished off with a set of factory Campagnolo Magnesium rims with the Goodyear Pantera-specific Arriva tires. Included with the purchase is the Marti Report reflecting the build documentation, along with the original Warranty Card from the first owner. This “Lusso” is surely an example set to please; from the sound of the engine roaring, to the sporty lines, to the quick responsiveness - this is the kind of rare sports car you've been waiting for! The Pantera is a mid-engined sports car produced by the De Tomaso car company of Italy from 1971 to 1992. Italian for "Panther", the Pantera was the automaker's most popular model, with over 7,000 manufactured over its 20-year production. The car was designed by the Italian design firm Ghia by American born designer Tom Tjaarda and replaced the De Tomaso Mangusta. Unlike the Mangusta, which employed a steel backbone chassis, the Pantera was a steel unibody design, the first instance of De Tomaso using this construction technique. The Pantera combines captivating Italian coachwork, a mid-engine race car chassis and a high-performance Ford V8 engine. The Pantera was assembled in Modena Italy by De Tomaso Automobili, a manufacturer of specialty automobiles founded in 1959 by former race car drivers Alejandro and Isabelle De Tomaso. The Pantera was designed for the Ford Motor Company at the request of Lee Iacocca, within Ford it was referred to as "Lee's car". They were sold in North America at specially selected Lincoln/Mercury dealerships. In 1971 the Pantera trumped its muscle car, Corvette, Jaguar and Porsche competition both in looks and in performance; it was the ultimate muscle car and sports car and ruled the streets on two continents. It accelerated to 60 mph in 5.5 seconds, covered the 1/4 mile in 13 seconds flat and had a top speed of 150 mph with a 4.22:1 final drive in the ZF. Automotive journalists of the time were unanimous in praising the Pantera's handling, claiming it set new standards for responsiveness and road holding in production automobiles. The "Lusso" (luxury) Pantera L was introduced in August 1972 as a 1972½ model. For the US market it featured a large black single front bumper that incorporated a built-in airfoil to reduce front end lift at high speeds, rather than the separate bumperettes still used abroad, as well as a 266 Net hp (198 kW) Cleveland engine. The "L" model featured many factory upgrades and updates that fixed most of the problems and issues the earlier cars experienced. It was so improved that the 1973 DeTomaso Pantera was Road Test Magazine’s Import car of the year beating Ferrari, Maserati, Lamborghini, and Porsche. During 1973 the dash was changed, going from two separate pods for the gauges to a unified unit with the dials angled towards the driver. The U.S. version 1974 Pantera GTS featured GTS badging but not the higher compression, solid lifter engine of its European GTS "cousin".